Wednesday and Thursday were sad days for us. Mom's three hour wake had a continual line of friends, family and loved ones that wrapped around the large room. The tributes dedicated to her during Mass had everyone who knew her feeling blessed that she was in their life. We will miss her so much and no matter how hard anyone tries, her shoes will not be filled. Damn...grieving is exhausting, draining, emotionally and physically demanding! Going through the motions, we all need life to take us by the hand to give us comfort. I can't...won't...put up a picture of Mom. She hated her picture on any public venue. That, my friends is called RESPECT. Bless you for honoring her 'no picture' edict! I am the same about pictures. I am sorry for your loss; I still miss my Mom every single day. Secondly, I haven't visited you in a long time because on my side bar it looks like you haven't updated your blog in three months! I have no idea why it hasn't been updating. I usually go through my sidebar and click on blogs, and yours hasn't updated. Anyway, I guess I won't go by that anymore. I hope you find some comfort in the happy memories in the next few days. now that the services are over, get some well-needed rest. Yup, it's so hard. And I understand about the picture thing. Hugs to you and hubby. I know exactly what you mean about grieving being exhausting. I'm sorry for your loss. Grief is profoundly exhausting. And i respect you for honoring her 'no photo' wish. You're a good daughter. Stopping by from Random 5 Friday...I'm sorry for the loss of your Mom! Grieving is a long process and out sympathies to you and Joe and your families. From what you have told us, the lady was very special. I'm sorry to hear about the loss of your mom. I'm the same way about pictures, so I totally understand. You're a good daughter for respecting her wishes. I'm so sorry for your loss. Grieving is indeed exahausting. Try to be kind to yourself and rest when you can. So sad to lose a mother - I can tell she'll always remain in your heart. 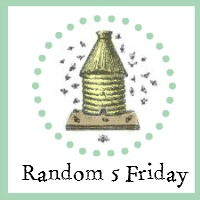 Stopping by from Random 5 Friday. My sympathy at this sad time. I am so sorry to hear about the loss of your mom. Bless you for not posting her photo considering her feelings about it.